Some psychology experiments are so wild and wacky that, at first glance, you can’t help wondering if the experimenters are unhinged. Harvard psychologist Daniel Wegner, who sadly passed away last year, was dedicated to making his experiments interesting to take part in and having them produce deep psychological insights. He usually succeeded on both levels. Below are five studies he and colleagues carried out and what they tell us about being human. Putting golf balls might not seem the most psychologically revealing activity but I can assure you it is! In this study participants were ushered into room lit only by a UV light. Some were given a putter that glowed orange, others a black one so they couldn’t see it (Wegner et al., 1998). They were then told to shoot a yellow ball at a glowing target and sometimes specifically asked not to overshoot the hole. Sometimes while putting they were also told to keep a six-digit number in their heads. A weird thing happened: when people tried particularly hard not to overshoot the hole, that was when they tended to overshoot it the most. If participants were told to try and keep a six-digit number in their heads at the same time, they overshot the hole even more. The purpose of the different coloured putter was to look at the influence of self-monitoring. The study found people’s putts became even worse when they could see the putter in their hands. Interpretation: known as an ‘ironic process’, sometimes the harder we try not to do something, the more likely we are to do it. This seems to be particularly true in sports where it’s vital to let the body do what it’s good at, rather than trying to take conscious control. Anyone who has ever tried to push something out of their minds (cake, cigarettes, a forbidden lover…) knows it’s apt to come back even stronger. Participants in this study were told to engage in a little footsie under the table with a stranger (Wegner et al., 1994). However, some pairs were told to keep their footsie secret from another couple who were also sat at the table, while other pairs did not keep their footsie a secret. When they were asked afterwards, the participants who’d been keeping their footsie secret were significantly more attracted to each other than those who’d been conducting their footsie openly. Interpretation: People love secrets: even the simplest things can become exciting if only they are kept secret. People obsess over secrets way more than things that are well-known to others. People were shown a video of a lifelike robot, either from the back so that they could only see a bunch of wires, or from the front (below) so they could see its childlike face (Gray & Wegner, 2012). 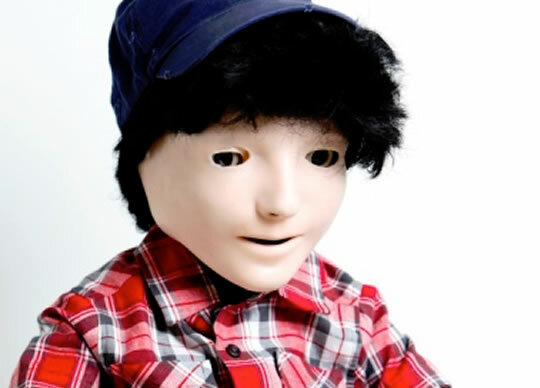 The robot–which was called ‘Kasper’ and designed to help children with autism–simply moved around in the video. What they found was that adults found the robot particularly creepy when they could see its human-like face, but much less so when all they could see was a bunch of wires. Interpretation: People find robots creepy because we associate experiencing thoughts and emotions with being human. When a human-like robot appears to be experiencing things we get creeped out. Experiencing the world through our senses may be even more fundamental to being human than our sense of having control over ourselves. People were shown pictures of both men and women with their shirts on and shirts off, with all their clothes on or completely naked (Gray et al., 2011). They were then asked questions that examined how we think about people based on whether or not they are wearing clothes. What they found was that when people are naked, we tend to think of them as having less control over themselves but more access to experience. Interpretation: When people are naked, it’s not accurate to say that we just objectify them, seeing them purely as physical objects without minds. However, we do change how we think about their minds. When naked, we see other people less as moral agents capable of competent actions and more as feeling beings. Participants in a study by Gray and Wegner (2008) were told the experimenters were investigating ‘psychophysical perception’; in fact it was all about pain. They were paired up with someone who was actually in on the experiment, but who participants thought was just another innocent like them. One part of the study involved the real participants receiving electrical shocks to their hand. It was set up so that some participants thought the other person had deliberately chosen to give them the pain perception test when there was another option that didn’t involve pain. For other participants, though, it appeared that the other person had no choice but to administer the pain perception test. Participants who thought the other person was deliberately inflicting the pain on them experienced the pain as more intense than those who thought the other person had no choice. Interpretation: pain has a large psychological component and part of that component can be social. When we are physically hurt it feels more intense if the other person meant to do it.